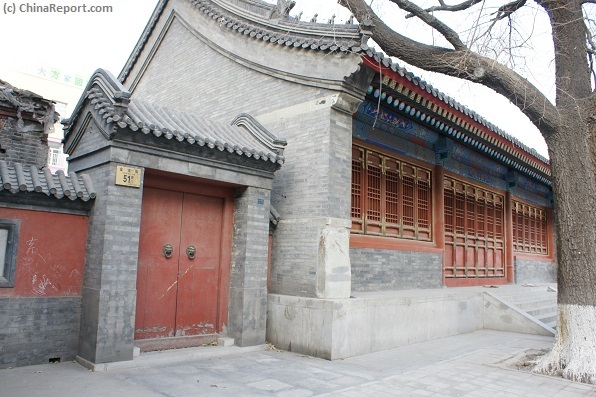 The Fa Xing Temple is but a small and usually overlooked Temple situated along Jinbao Street in the Dongcheng District of Beijing. Not on the list of the main stream of tourists and international travelers flocking to Beijing who would rather dwell to the more grandiose and spectacular sites the Faxing Temple draws little or no attention. 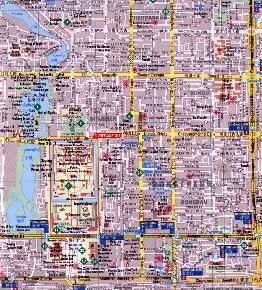 Map of DongCheng District with Location of Zhi Hua Temple, Faxing Temple and Galaxy soho. Click Map to go to Full Version. The seemingly only building of the current day Faxing Temple located at Jinbao Street No.51 In the Dongcheng District of Beijing on a sunny afternoon in December 2013.
during the very last Reign Period of the Ming Era, the rule of Emperor Chongzhen (1628 AD - 1644AD). Faxing was never a large place of spectacular architecture, hence it was a temple mostly renowned for its frescoes. A Frontal of the one building of Faxing Temple located at Jinbao Street. All windows an doors are locked shut. State Protection December 2013. On the afternoon of our visit there was no sign of any activity at the building or the gate adjacent. People go back and forth along Jingbao Street but hardly anyone seems to pay any attention to the Temple Building. Although at the moment it does not seem that Faxing Temple is a much spectacular site, it may be interesting to just pass by when browsing around Jinbao Street and the smaller alleys due north of Jinbao. Above: On the left side of the Main and seemingly only Hall of Faxing Temple stands a small gate. A plaquette attached to the red chalked wall identifies the site as a Cultural Historical Relic under State Protection. Below: text of the inscribed plaquette. 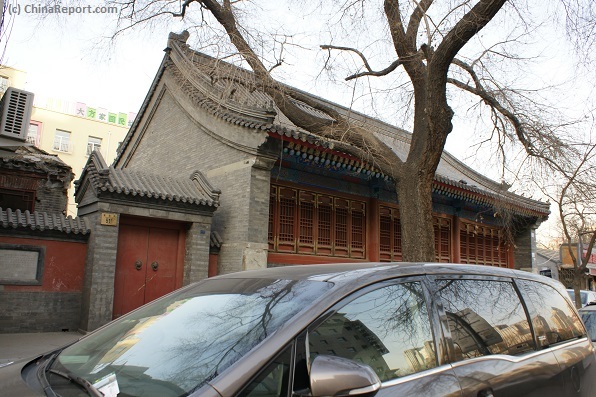 eastward to the oldest Ming Dynasty Era Temple in the city of Beijing. This nearby Temple is known as the Zhihua Temple which offers a site of considerably more interest. Among the treasures are a fairly unique ancient stone library cabinet especially crafted to hold the sacred buddhist scriptures as well as a prayer hall holding precious statues with their original Ming Era decorations. Both treasure items are rarely seen anywhere else. After visiting the Zhihua Temple one could move on northward to have a look at the ultra-modern architecture of fairly renowned Galaxy Soho building which has been constructed on the west side of ChaoyangMen, just inside and along the second ring road. From Galaxy Soho building take the subway from Chaoyangmen Station to head back to your hotel or reach any other destination in the old city of Beijing. 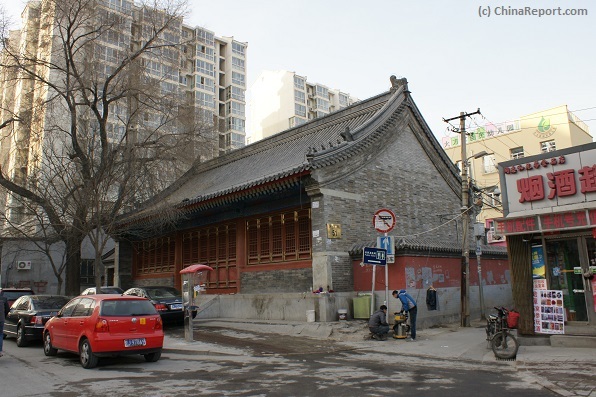 For anyone in search of some of the ancient Hutong charm for which the city of Beijing was famous not too long ago, as with the block to the north, the block along the south side of Jinbao Street offers some space for exploration and dicovery. To the south of Jinbao Street lies another city block disected by small alleys some of which hide more small Hutong Gems in the form of ancient gates and courtyards. Although there are no major historic landmarks to be found there you could head to the south side of the street and reach to very eastern end of Jinbao Street to cut south and explore the Hutong. 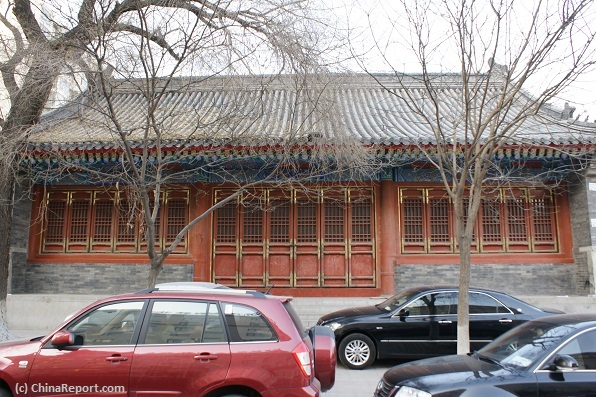 At this location stands an officially protected ancient courtyard of Beijing with in the adjoining alleys a number of old or recently restored Courtyard Gates of considerable interest. As a last option one might travel westward up on Jinbao Street to find the most interesting Traditional Chinese Medicine dispensary on the corner of Jinbao Street and Chaoyangmen South Alley. 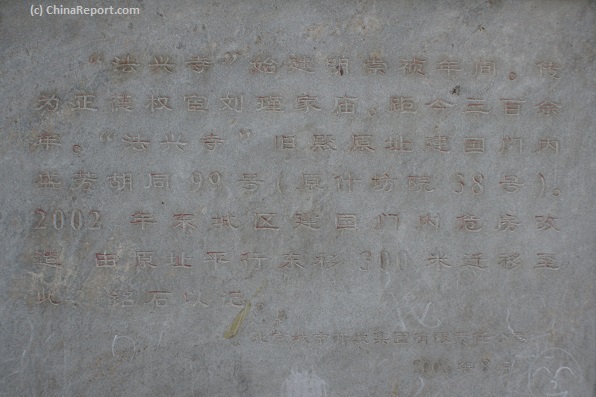 The text on the inscribed plaquette speaks of a relocation of the Temple in the year 2002.